The stratum germinativum of the epithelium consists of a stratum basale, a stratum intermedium and a stratum transitivum. 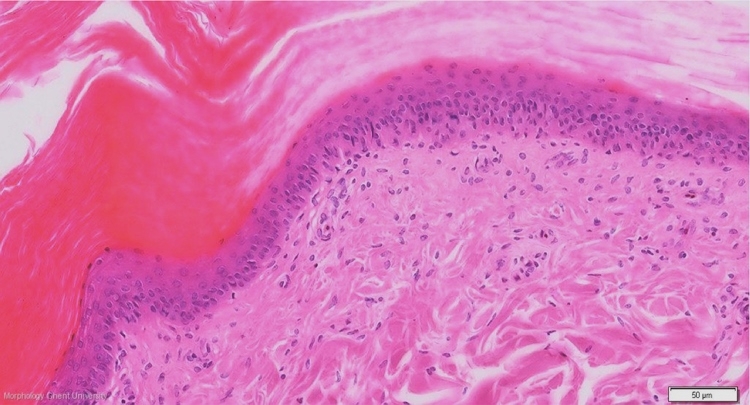 The dermis consists of a superficial layer of fine collagene fibers (stratum superficiale), an intermediate layer of dense collagenic tissue (stratum compactum) and a transitional, more loose and elastic layer between the dermis and hypodermis (stratum laxum). Underneath the sulci, the dense layer of the dermis is most constricted.